When we went to Warsaw to acquire my husband’s visa from the consulate (it’s a long story, but in short, the US Consulate in Rīga does not do fiance visas, forcing us to go to Warsaw) we had the great fortune eat at a wonderful traditional Polish restaurant called Chlopskie Jadlo. Chlopskie Jadlo, which we found by virtue of its being quite close to a popular biergarten-style restaurant around the block from our room at the MDM Hotel (I also highly recommend this hotel if you’re unfortunate enough to go to Warsaw*), serves up traditional cuisine for reasonable prices. There isn’t much English spoken by the staff (or Russian, or German, as we found to our dismay), but English menus are available. The food is worth it and it’s worth the wait you can encounter at dinnertime. Hands down, this restaurant is one of the best I’ve been to anywhere in the world. We ordered a flight of soups to maximize our short window of opportunity. We were served a clear borscht (beet soup), a woodland mushroom soup, a rye flour soup, and a sauerkraut soup. All of them were fantastic, but the sauerkraut soup was my favorite. Included with our meal was a quarter of a large rye loaf, garlic butter and dradži**, which I simply fell in love with. My heart, not so much, and I fear my cholesterol count skyrocketed after that meal, but it was worth it. One day, we’ll make our own versions of all four of the soups we had. I made a mushroom soup a few weeks ago that came out beautifully. We’re still looking for a starting point for the rye flour and will get around to the clear borscht after making a traditional borscht. This week, however, it’s time to make a sauerkraut soup. This one is based on a traditional Latvian recipe. It’s meatier and hardier than the version we had in Poland, making it a better candidate for a main course. Sauerkraut, which is fermented cabbage, is cheap and easy to come by. It’s great as a side to bratwurst, delicious on burgers, and makes a wonderful soup. I served this with a side of mini baguettes I baked from some french bread dough I made earlier this week. If using fresh pork, brown in skillet first. Put sauerkraut into a 2 qt sauce pot, cover with water, stir in barley and pork then simmer until the sauerkraut and pork are almost tender (about 45 minutes). While this cooks, in a skillet set over medium heat, saute onion and carrot in oil until lightly browned. Once the pork and sauerkraut are nearly tender, add onions and carrots to the soup and simmer for 10 – 15 minutes, adding additional water if necessary. Taste and adjust seasonings. 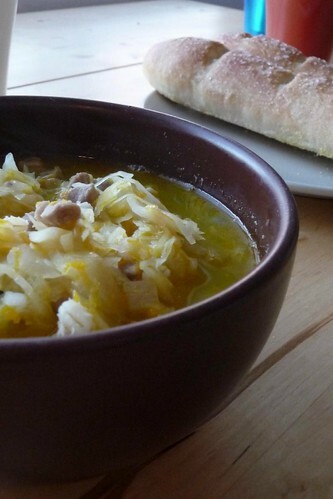 Sauerkraut soup is often served with chopped green onion and sour cream. 1. Use any kind of pork you have: fresh, cured or smoked. I used meat from a country rib cut. If you use fresh, brown the pork before adding it to the water so it has a bit more flavor. 2. My husband and I prefer a stronger sour taste from our sauerkraut, but if you’re not familiar with it, Libby’s is an excellent, inexpensive brand with a mild taste. 3. This is also a great soup if you’re watching your weight. According to my recipe manager, this soup clocks in around 175 calories per serving with 3g of fat! * I even recommend the MDM’s breakfast buffet, though I agree with Tony Bourdain in that the place you’re most likely to get sick is NOT the popular street vendor but the hotel buffets. The MDM’s buffet, however, had incredibly good food: fresh, piping hot and delicious. ** Dradži, as best as I can describe it, is rendered pork fat and onions with cracklins and salt. Once it cools and solidifies, you can spread it thickly on large hunks of bread. Sounds like a heart attack waiting to happen, doesn’t it? Delicious! This entry was posted in dairy-free, gluten-free, latvian, pork, recipes, soup, untranslated. Bookmark the permalink.